Many years later, man and wife found innocent in death of son - but their kids have to remain Christian! 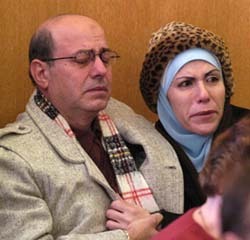 Ahmed and Rehab Amer learn their son's death certificate will now say accidental death. What: Osteogenesis imperfecta, or brittle bone disease, is a genetic disorder characterized by bones that break easily, often from little or no apparent cause. There are at least four recognized forms of the disorder, representing a range of severities. For example, a person may have just a few or as many as several hundred fractures in a lifetime. Prevalence: While the number of people affected in the United States is unknown, the best estimate suggests a minimum of 20,000 and possibly as many as 50,000. Most cases are caused by a dominant genetic defect. Some children inherit the disorder from a parent. Other children are born with the disease even though there is no family history of it. Treatment: There is no cure. Treatment is directed toward preventing or controlling the symptoms, maximizing independent mobility, and developing optimal bone mass and muscle strength. People with the disease are encouraged to exercise as much as possible to promote muscle and bone strength, which can help prevent fractures. Swimming and water therapy are common exercise choices. Do you recall this story? What about today? Without Our Own Media Source - Where will any of us be in the future? Support www.GuideUS.tv (satellite channel) - Before it's too late. This couple were finally cleared of any wrongdoing the death of their infant son, Samier. Tearful Dearborn parents want to reunite with 3 kids taken from them. DETROIT - Rehab and Ahmed Amer hope their long nightmare is over and that their children will believe that they did not murder their 2-year-old brother. "My son called out from the grave and said, 'My momma did not do this!'." Rehab Amer said after a court hearing Tuesday. "This is for you, my son, Mohammed Ali. This is for you, my daughter, Sueheir. This is for you, my daughter, Zinabe. "I wish you all the best, and please come home!" "Two-year-old Samier Amer's death in 1985 was an accident, not a homicide", said retired Wayne County Medical Examiner Dr. Werner Spitz. After the county struck an agreement with the Amers, Wayne Circuit Judge Edward Thomas on Tuesday ordered the county and state to allow Spitz to change the toddler's death certificate to list the death as accidental. The state removed the three children from the Amers' home after the death of Samier. Mohammed Ali, now Adam Lee, lives in Minnesota, said his adoptive mother, Essie Stamper of Clarkston. Stamper would not reveal where Sueheir, now Suzanne Brook, lives. Zinabe, now Rochelle, lives with Stamper in Clarkston, and is graduating from high school this year. The Amers have visited their children, sometimes in the company of their adoptive parents, several times in the past few years. The Amers believe the children, who were removed from their custody and placed in foster care by the state 17 years ago, still have doubts about whether the couple murdered Samier. "When Sueheir told me, 'I cannot decide until I die and go to heaven and talk with my brother about what happened,' I knew by the grace of God that I had to do something," Rehab Amer said. Rehab Amer was charged with second-degree murder in 1985 and acquitted by a jury that deliberated for less than a half hour. The Amers and medical experts said their toddler had a rare brittle bone disease, which led to his death. The Amers decided two years ago to exhume the body of their dead son. They persuaded Spitz to conduct another examination. Spitz said Tuesday that all of his work determined facts that are "utterly inconsistent" with homicide. Thomas, who approached the Amers to console them at the end of the court session, said from the bench that he hoped his decision would help bring the Amers "some peace." "I'm just sorry it took so long," the judge said. Whether the new, official cause of death will help the Amers heal the breach with their children is less than clear, however. The children now range in age from about 17 to 23. Psychologists say that it may be another decade before the wrongly accused Amers receive what they are really seeking: a restored relationship with their three surviving children. Jacque Martin-Downs, a family therapist in Livonia, said children often prove resilient, and they do not forget their natural parents. "It's not like their memories are wiped clear," Martin-Downs said. "I imagine they have feelings of loyalty to the parents, and now they have loyalty to the adoptive parents. They're kind of caught in the middle." Marian Faupel, a lawyer from Ann Arbor who represented the Amers several years ago, said it is evident from her career in family law that "the jury remains out with regard to the child's relationship to parents, as adults." "It's premature to judge the cost or benefit in these parent issue cases until the children are in their late 20s," she said. Stamper and her husband raised the three Muslim children as Christians, raising an outcry in the Muslim community. In a telephone interview Tuesday, she said she believes the children do not think their parents murdered their brother. "I think the Amers are beautiful people," Stamper said. "We've had them over to the house. They've visited with the children. I don't personally believe that the woman ever hurt her child, because they really treasure these children when they come to see them. "The children were never taught that the parent murdered their brother - never," Stamper said. "By the time we adopted them, I don't think they knew what happened. I don't think they ever had an idea. They really don't know." Stamper said that to the extent that any conflict continues between the three children and their birth parents, it is because of elapsed time, and the fact that the children were raised in a different household. "I'm not sure my kids hold it against them, in any respect," Stamper said. "But there gets to be kind of a conflict between the kids and their parents. And it's been very hard for her losing all four of her children, really. And that's understandable, of course. If it had happened to me, I don't know that I could have made it." But Rehab and Ahmed Amer have a different view of things, and they greeted the settlement of the case as an answer to prayers long prayed. "It is God's hand, what you see today," Rehab Amer said. "It's the end of a nightmare. To be able at least to look at my son's death certificate and to see the truth, it is good. I hope that will make a difference to my children. At least they will look at the certificate and believe. This is God's work." "It's somewhat of a relief that my children will know that their parents did not kill their brother, as they were brainwashed and told to believe," Ahmed Amer said. "My kids are free to come home to us." "I pray that what happened today will send a message," Rehab said. "I was told that I could only see my children again if I admitted what I did. As God is my witness, I was not going to admit to something I did not do. "And, now, it is here for all to see. I did not kill my child."